Backed with huge industry experience and market understanding, we are involved in providing a wide variety of Advance Life Ambulance for our valued patrons. Fabricated Ambulance on Tata Winger 3488WB with Auto Loader Stretcher. Other ALS/BLS Equipment would be charged extra. We are operating Ground ambulances in New Delhi for the past 15 years and have vast experience of operating Basic and Advance life support ambulances. Presently all the services are provided ON NON EMERGENCY basis. We operate between 7.00 am to 9.00 pm only. The request for pick and drop in the night time needs to be booked in advance. However upon booking we provide full services. Road Ambulance is an alternative for non-critical and critical patients who do not want to fly or need to be relocated from one facility to another. And is a logical choice for transports that require less than 50 hours of driving time and /or are 2000KM or under. Supported by a meticulous and attentive crew of employees, we have readily focused towards offering to our customers’ highly incomparable Ambulance Rental Services to our patrons. 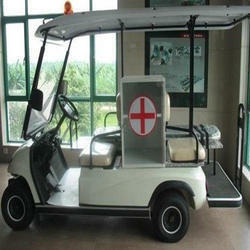 These provided ambulances are offered to our patrons at reasonable rates. Besides this, their reliability and exactness makes these highly recommended. It is based on a raised-roof Mercedes or Toyota Haise van that features a spacious interior with all the attention to details. The interior surfaces of the unit are made from Aluminum extrusions and other thermoplastic material. Pet Ambulance - For pickup & drop facility of pets. Our road ambulances are ICU on wheel vehicles with life saving State-Of-Art medical equipments & all emergency medications thus creating an environment similar to an Intensive Care Unit. This vehicle is AC and used for long and short journey to transfer the human remains. This vehicle has the freezing facilities for the human remains. 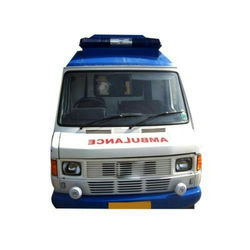 We are engaged in offering a quality approved range of Ambulance Van. Azad Coach Builder Pvt. Ltd.